Een zonnige internationale Boppin’the Rock met de stem van niemand minder dan Lil Gizelle, de leading lady van Wild Records, en het Franse Roy Thompson & the Mellow Kings. Don’t stop to bop. Btw. : vvk tickets zijn voor dit concert aanzienlijk goedkoper dan aan de deur. What makes Lil Gizzelle so unique? Two words: The Voice. Wild discovered Lil Gizzelle singing in a local Jump Rhythm & Blues band in Los Angeles, the band were okay, but the voice from this small young (19 years old) Mexican girl just blew us away. When Wild asked Lil Gizzelle what deal she had made with the Devil/God for her voice, she said, “I don’t know, I have always been able to sing a little bit (understatement of the century). There are a lot of female vocalists out there trying to sing rock n roll, rockabilly, blues; most of them if they’re lucky, have very average voices or if no voices, they just put on a cowboy hat and try to sing rockabilly songs. What is exciting to Wild Records finding Lil Gizzelle with her amazing voice is that she can really sing gospel, blues, rhythm & blues, or rock n roll. THese are the musical areas that Lil Gizzelle’s first CD “Devil or Angel” covers. 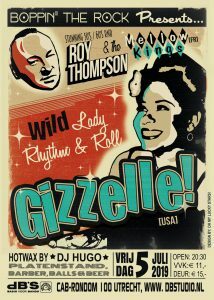 Lil Gizzelle performed three times over the Viva Las Vegas Weekender in 2006, and each times she sang, she made the place become silent and the grown men and woman cry. Lil Gizzelle is the best female singer Wild has ever heard. Reb Wild Records She’s coming soon to a town near you, don’t miss her! !